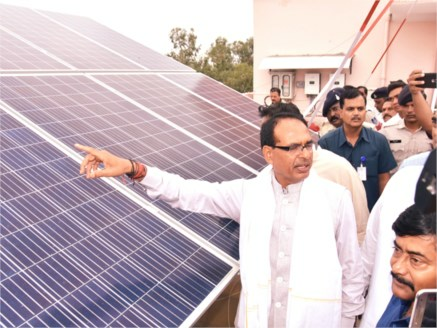 Chief Minister Shivraj Singh Chouhan inaugurated the first Government Roof Top Solar Energy Plant of 200 K.W. capacity installed on the building of Madhya Pradesh Board of Secondary Education in Bhopal on July 10. On the occasion, the Chief Minister said that solar energy has become the energy of both future and present. Madhya Pradesh has established its image in the entire country in the production of renewable energy. The plant built at a cost of Rs. 1 crore 20 lakh has started producing electricity. CM Chouhan further mentioned that Solar Energy is the only effective option to save the environment. Work to generate solar energy through solar panels has been started in the government buildings. Cost of solar energy plant is recovered within a period of 3 to 4 years. He stated that the first such solar energy plant of the World has been set up at Rewa, which has energy production cost of Rs. 2 and 97 paise. The Chief Minister said that every citizen must plant one sapling for environment conservation and protect it. A plantation campaign is being started from July 15 in the state. He praised the work of the Board of Secondary Education for providing furniture in schools and for improving the infrastructure. He informed that the Board of Secondary Education will run 3 more schools. CM Chouhan lauded the Board for its initiative to bestow awards to 5 schools with best results. He also honoured officers-employees of the Board for their excellent work. Chairman of Board of Secondary Education, Shri RS Mohanti informed that owing to the efforts of the Chief Minister, Madhya Pradesh has achieved the first position in the country today in the production of renewable energy. He mentioned that various online services have been provided by the Board of Secondary Education to the children and the Board has taken initiative to produce solar energy by deriving benefit from the government’s policy.